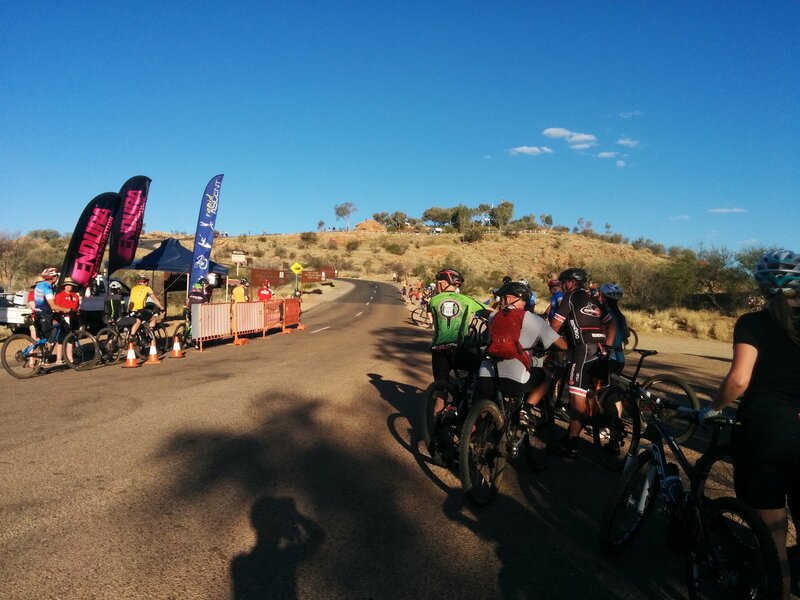 I had a ball on this afternoon’s stage – a time trial up Anzac Hill in the middle of Alice Springs. Averaging 9% over 350m on a sealed road, it was an uphill sprint, with riders setting off in 30 second intervals. I was quietly looking forward to the stage, having no grand expectations, but I love the idea of the stage. Against the clock. Uphill. Flat-out. Done. Most riders made little modification to their bikes, as per race rules, but I’d hazard a guess that most ditched all their spare bits n bobs and pumped tyres up to a gazillion psi. Having found out I finished the morning’s stage in 22nd place, I was due to start at exactly 5:39pm. Glen and Bill had already started before me, with Aidan, Matt and Chris behind and in that order. I’d scouted the climb with Bill yesterday, and loved the winding nature of the ascent, with no clear visibility of the summit. An event staffer held my saddle as I prepared to take-off, and at 5:39 I cranked over a big gear before settling onto the seat for the first 50m of shallower gradient. Perhaps 100m into the climb, there is a sharp, cambered turn that simultaneously kicks up in steepness, and just before this point I opted to get out of the saddle and push harder. I felt pretty aero off the start, but now it was time to get the bars moving! Gear selection was probably crucial, and I was satisfied that I’d picked the right one as I banked the corner in the right lane, and was able to maintain the effort. A crowd was forming further up the climb, but I was busy chewing my stem and urging myself on. It didn’t feel like I was really giving it everything, but it also felt far from slow. Still out of the saddle, and trying to give it more with 50m to go, the crowd now surging, I took a peek at my Garmin to check my time, to discover I was way off KOM pace. Also at this moment, my right foot unfortunately unclipped from the pedal, forcing me back into the saddle and searching for re-entry. So close to the finish line, but with some sharp, steep corners still to go, I felt forced to stay seated to keep my momentum up and couldn’t stand for a final effort. No matter – I was soon at the finish in a respectable 55 seconds, probably a couple of seconds off what I might have done had a stayed clipped in, and certainly a long way off my potential. But I was satisfied. In the scheme of the event, it made little difference to overall standings, and I was happy to put in a fast time, if not my best. Matt held the lead with a time of 45 seconds, but soon lost it to a flyer by young Luke Pankhurst of 42 seconds, equally the course record set by Ben Mather a previous year. Most impressive to me was Aidan, giving me a flogging with a time of 52 seconds on his hardtail – awesome redemption for what should have been an amazing time for him this morning had it not been for several flats. Another individual TT tomorrow morning, but this time on a 20km course of a fairly technical nature. Looking to hit my stride tomorrow, but I know it’ll be a tough course to set a good time.